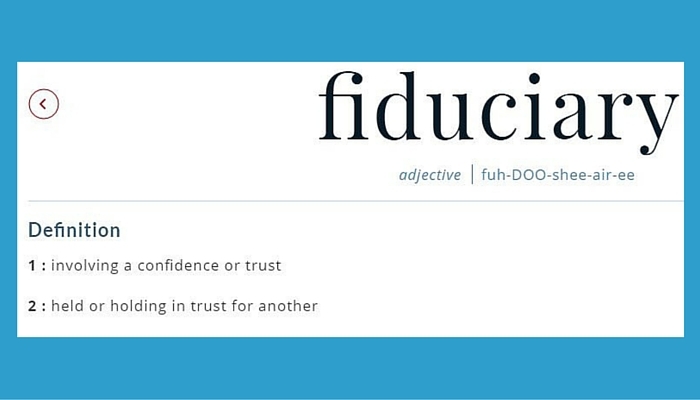 Given this definition it makes sense that your financial adviser should be a fiduciary, right? You trust that person with your life savings and critical financial decisions and you have confidence they are providing advice that is in your best interest. So now you might be wondering, why is this a new rule? For some of us, it is NOT new at all. As a fee-only Registered Investment Adviser we have always been held to a fiduciary duty. In fact, as a CPA financial planner we are further held to the AICPA's code of professional conduct AND their Standards in Personal Financial Planning. We ALWAYS put our clients' interests first and do everything we can to avoid any potential conflicts of interest. Unfortunately many other people in our business who put themselves out there as "financial advisers" have not always acted as a fiduciary. There is even another standard some have been held to, which probably surprises many people who are not familiar with the rules governing investment advice. That standard is called the "suitability standard" and it says that a financial adviser simply needs to make recommendations that are "suitable" for the client. It's a vague, broad definition that leaves a lot of room for the adviser to determine just what exactly is suitable. The best analogy I've heard comes from my colleague Michael Kitces, who compares it to someone selling you a suit. Being held to a suitability standard means that salesman simply needs to make sure the suit he sells you fits. He has no obligation to tell you if that suit looks terrible on you. If he were held to a fiduciary standard he would have to do what is in your best interest and help you find a suit that looks better on you. It won't go into effect until April 2017. It only applies to retirement accounts, so if you are receiving financial advice on a taxable account your adviser still might not be adhering to a fiduciary role. There is a way around the rule that some people might try to exploit called the "Best Interests Contract Exception". While it remains to be seen how this will work in practice, it would essentially require an adviser to have their client sign a form waiving the requirement to give advice that is in your best interests. While there could be some legitimate reasons for doing so, this will be something that needs to be scrutinized and not just signed as part of the regular adviser agreement. While this rule will help bring the standards up in the world of financial advice, you still need to be careful when choosing an adviser. You should always understand how they are paid and whether they are acting as a fiduciary for you. You are trusting this person with incredibly important information and decisions that could impact the rest of your life so due diligence is required. If you want to learn more about how we help our clients,contact us.